Through this site we hope to share some of the great times my wife and I have had cycle touring, and give some help and information to those who might consider cycle touring as an alternative type of holiday. 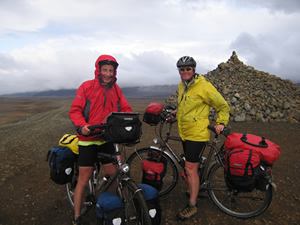 Cycle touring with a tent is a great way to see and explore a country. Here are a few things to recommend it. It's a relaxing way to see the country side, you tend to see and experience more of the country side from a bike than a car! There's more chance to explore the countryside by taking quieter tracks and lanes. You can go at your own pace, we have a brief idea of a route, but adjust it to how we feel and weather conditions. If we find a place that we like, we often stay for a few days and explore before moving on. It's not as expensive as some holidays. It's a healthy and environmentally friendly way to travel. By staying on local campsites and tourist farms there is more chance of getting to know the local people and understanding their culture. Check out the links above for more information. 'Unfortunately we do not organise cycling tours or holidays, we just hope that the information contained in these pages might help or inspire you to organise your own'. or leave a message on our Facebook page. Details of any site updates will appear in our RSS Feed and on our facebook page. 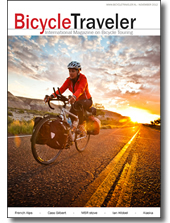 'Bicycle Traveler' is a free international magazine devoted to bicycle touring. Packed with stunning photography and entertaining stories, it will make you want to grab your bike and hit the road. You can download it from www.bicycletraveler.nl. 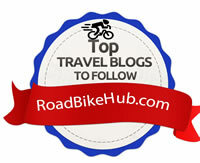 Grace Johnson who is the founding editor and designer of Bicycle Traveler magazine in colaboration with photographer Paul Jeurissen have produced some great free eBooks. Sadly the Cyclists' Defence Fund's private prosecution to bring justice for Michael and his family has ended in the driver's acquittal. You can read Duncan Dollimore's account of preceedings in the Old Bailey here. As a touring cyclists it is always useful to know your First Aid in case of an accident or ermergency and we would always reccomend gettting some First Aid training. Second to that download the St John ambulance First Aid App specially written for cyclists to your Android phone or iPhone.